I wrote two days ago about how the country of Georgia has achieved impressive economic performance thanks to major reforms to reduce the size and scope of government. 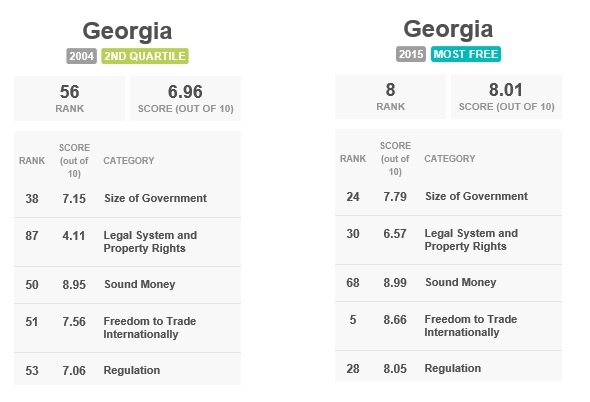 Indeed, Georgia jumped from #56 to #8 in Economic Freedom of the World between 2004 and 2015, a remarkable climb. Today, I want to focus on what the country has achieved with regard to fiscal policy. In part, this is an opportunity to highlight that Georgia is one of many nations to adopt a flat tax. Georgia’s 20 percent flat tax not only has a single rate, but also doesn’t have destructive forms of double taxation like a death tax or capital gains tax (it also has an Estonian-style corporate tax). But my main goal is to draw attention to the fiscal rules in Georgia. Both the nation’s Constitution and its Organic Law have provisions that are designed to limit the growth of government. First, let’s look at Article 94 of the Georgian Constitution, which states that no new taxes are allowed unless approved by a vote of the people. The Organic Law also has good provisions on taxation, most notably a prohibition on using a referendum to adopt a discriminatory “progressive” tax (too bad we don’t have such a provision in America!). Here’s the part that I really like. There’s an aggregate spending cap. The government’s budget can’t consume more than 30 percent of economic output. It also includes European Union-style “Maastricht” limits on deficits and debt, though I’ll simply observe that those rules are irrelevant if there’s a limit on overall spending. In any event, the burden of spending in Georgia does comply with the spending cap, according to IMF data. Though I’ll be curious to see what happens if there’s ever a serious recession. If that happens, GDP falls, which could make it politically difficult to obey the cap. Which is why I prefer the Swiss approach of simply allowing government to grow by a small amount every year. That seems more politically sustainable. But I’m happy with anything to fulfills my Golden Rule.